I’m going to post a weekly draft piece on Football Fridays here on PackersTalk.com. Mock drafts using Fanspeak, my custom Packers Big Board, scouting reports, links to film breakdown, you never know what you might get. 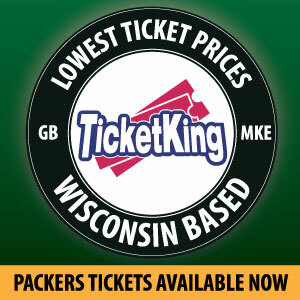 Stay tuned to Packers Football Friday all the way until draft weekend to find out. In these mock drafts, I’m going to focus on the first five rounds of the draft. According to most calculations, the Packers are going to have nine picks in the first five rounds. Will they use them all in the spots they’re likely to be placed in? No. That seems very unlikely. Am I going to sit here and try to guess where Green Bay is going to move around to? No. 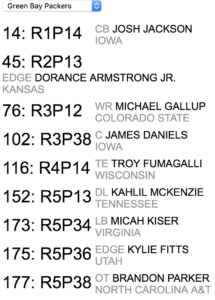 This draft was completed using Fanspeak’s On the Clock technology. The algorithm was set to “difficult” and Bleacher Report’s Matt Miller’s big board was used. I’ll probably switch back and forth between big boards as we get closer and closer to draft season. I’ve found the “user-voted” team needs to be the most accurate. Fans that obsess about their own team enough to use Fanspeak pay attention to the needs of their squad. I love Josh Jackson’s game. He’s the #1 corner in this class for me. Paying attention to Pettine’s schemes over the years told me one thing: you gotta have corners. Pettine can generate pressure using almost anyone. Go watch what he did with guys like Aaron Maybin, Vernon Gholston and Calvin Pace. Castoffs that no one could get anything out of. I don’t leave Pettine’s cupboard bare, though. Dorance Armstrong, Jr. was a productive player on a bad team. He played with his hand on the ground in college, but that won’t matter as much with Pettine’s multiple schemes. This gives Pettine Nick Perry, Vince Biegel, Clay Matthews and Armstrong, Jr. to work with. Next up? An outside receiver to pair with Davante Adams. Michael Gallup, he of 100 catches his senior year at Colorado State, gets thrown immediately into a competition with Geronimo Allison and Michael Clark for snaps on the outside. Gallup has the featured receiver build at 6’1″ 205 and his athletic fluidity is mesmerizing. James Daniels provides the Packers with interior depth and competition for the RG spot for Justin McCray. Troy Fumagali joins a competition with a free agent TE as a big target for Rodgers down the seam. Kahlil McKenzie (Reggie’s son) gives another big body for a young and supremely talented defensive line. Micah Kizer finally provides true LB depth behind Ryan and Martinez and Fitts another crack at a Fackrell-type (btw, I would Brad Jones Fackrell. Time to try him off the ball, he’s a former safety that loves to cover). Brandon Parker is an athletic tackle type from a smaller school. Sound familiar? This entry was posted in Authors, NFL Draft, Ross Uglem and tagged Brandon Parker, draft, Josh Jackson, Michael Gallup, Ross Uglem. Bookmark the permalink. Thanks for getting the mocks going here Ross, and i look forward to reading future mocks from you. in your first mock, i like a lot of your reasoning.. you have provided a good starting point. for me, i tend not to take my own evaluations of prospects seriously especially before the Senior Bowl and the Combine. nevertheless, it us fun to play armchair GM. here are some of my general thoughts for the Packers 2018 draft: the position groups that excite me the most are: RB, QB, CB, WR and the tops of groups like LB, TE and DI. like most years, i have delayed looking at tape of OL guys and safeties.. at this point, i do note have feelings about these groups. i do feel pretty strongly that the EDGE group has very few interesting prospects. for the Packers, if one goes for a match of need and BAP at pick #14, one can assume either an EDGE or CB, with outside chances at OT or TE (TE really unlikely), will be selected. i will wait until after Senior Bowl and Combine to look for an EDGE guy in this draft.. too many questions for this group for me.. Key, if he does well in his interviews (how will we know?)? i am pretty sure people will look past interception numbers to evaluate the cbs. 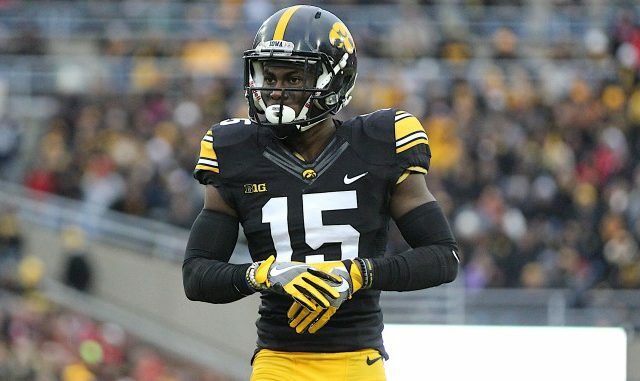 the level of Josh Jackson’s physicality is a concern for me, beyond that, i think by Combine time, we will learn that there are some talented cbs who should be available in round 2 and even round 3. i feel the same about WRs.. which brings me to my favorite pick of your mock: Michael Gallup in Round 3.. nice. i am really interested in a high end WR, CB or TE for round 3.. i feel that Gallup fits that. and with Gallup scooped up, going with Wisconsin TE Fumagali in round 4 seems both reasonable and likely eye-catching for most Packers fans. with four 5th round picks, the Packers will likely have a busy and interesting draft on Day 3.. could the Packers entertain taking another stab at a 5th round back up QB? how about a 2nd TE draftee? it is fun to think of the possibilities. I agree. Ross is one of our very best at the Draft and I always love reading his analysis and mocks. Speaking of, I’ll be doing something similar on Tuesday morning. I’ll have a few propects to keep an eye on for the draft at each position and my own mock. Teaser: I also have Josh Jackson in green and gold.